Not only is spring in full bloom, but the gallery has some great splashes of color as well. 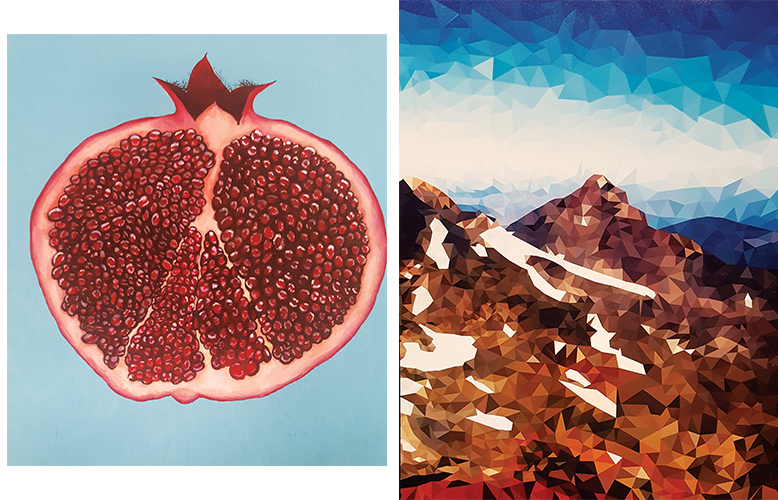 The gallery’s Second Saturday reception is May 11, 4-7pm. 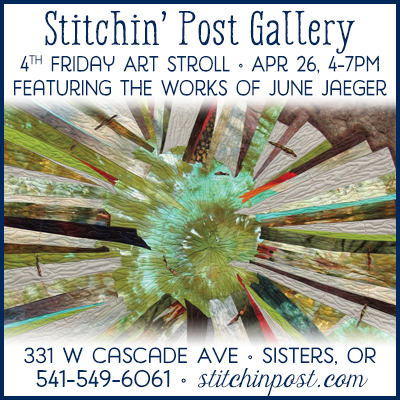 Susan Harkness-Williams, Shirley C. Checkos, Diane Miyauchi and Stella Rose Powell are the featured artists. Bring mom to the party and watch closely for clues to what she would really like for Mother’s Day! All of the artists will be there to share refreshments with you, but you may want to pay special attention to this month’s featured artists. All four of the artists have been with the gallery long enough to have a following, but this Spring they are showing new pieces that are going to be more popular than ever. Susan’s custom gourd art and her fantastic jewelry have always been a favorite for gallery patrons. Between the two different mediums, Susan has an incredible breadth of expression. 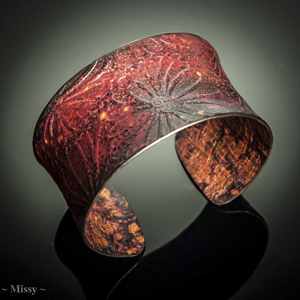 She brings her serious archeology interests to the art studio when creating each of the beautiful pieces. Travels to places like Sienna, Italy, to serve as an illustrator for found Etruscan archeology treasures of the day, only add to the depth of Susan’s artistic skill set. Although her artwork is found nationwide in selective private galleries, Susan is extremely successful right here in her own neighborhood of Central Oregon. 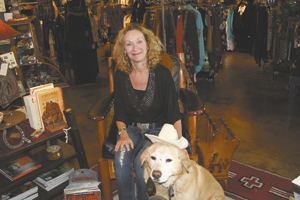 You have likely seen her covered in all of the local press, or perhaps you have browsed her vessels or wearable art jewelry at the High Desert Museum. Award winning Shirley Checkos is a fine art oil painter whose art grabs your attention. The artist’s deep connection with wildlife is immediately obvious when you gaze into the eyes of her subjects in her unique wildlife paintings. It seems that the viewer can “look into the soul” of each animal. Each painted canvas depicts a still, yet breathtaking moment in time. Viewers are amazed at the almost “high definition” details in her pieces. 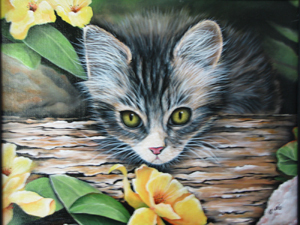 Shirley’s love for animals is expressed in each of her paintings. You will be astounded by a regal male lion watching over his pride or a female giraffe taking care of her baby. Maybe an African elephant leading its herd or a hummingbird tasting a flower’s sweet nectar will catch your attention. The artist has actually traveled to Africa to expand her artistic vision. Viewing the animals in their natural habitat adds a layer of compassion for nature’s magnificent creatures. Also an accomplished portrait artist, Shirley’s enduring connection to nature is expressed through the eyes of her subjects, conveying the graceful and quiet moments of human life. Pottery artist Diane Miyauchi knows that art is important to every aspect of our life. In keeping with that knowledge, Diane creates functional pottery. That means that Diane makes fine art designed to be used and to delight every day. 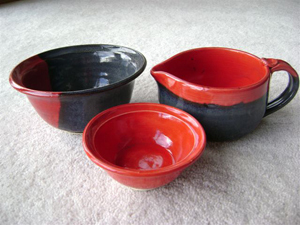 Maybe a trio of multisized bowls, all with a shinny black on the outer surface and each with a bright primary color on the inside, would look stunning holding fruit on your kitchen counter. Or perhaps you would like a beautifully designed pie plate or serving dish that will ultimately become a family heirloom. Mixing bowls and small bowls with a handle that are just right for making salad dressing are often stuffed with a recipe that would be a perfect use for this piece of art. Although Diane’s pottery is very functional (it can safely be placed in a microwave or dishwasher) and can be used daily for a multitude of tasks, it is still very much a beautiful piece of art that can be displayed when not in use. Stella Rose Powell is somehow able to convert her high energy, quirky personality in to the most amazing pieces of jewelry. And the really exciting thing is that the style of her pieces is always evolving. If you are lucky enough to already own a pair of earrings, necklace, or bracelet, don’t let that stop you from hustling down to the Artists’ Gallery to see Stella’s latest creations. 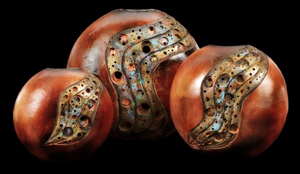 Stella’s latest passion is hand forged copper cuffs with fired patinas. 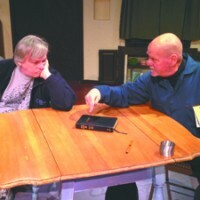 The heat is on! With spring in the air and the anticipation of summer, the warm hues of copper are reminiscent of sunny days and hot desert nights. All of the colors are created with a torch and the textures are roll printed from various materials. Each piece is one of a kind because the process is not a science, but art. It is the inherent properties of the metal that bring out the beauty. Stella coaxes the process along using heat, cold water, and salts. At the end of this artistic process, each piece is carefully protected from the air with a special coating giving it lasting beauty and a finished look. Artists’s Gallery Sunriver Paper Station building 541-593-2127 or 541-593-8274, www.artistsgallerysunriver.com.